A whole football field of queer people, hula hooping in formation, moving in unison, individuals involved in a mass action together. This was my initial vision for this project. Early video art in the 1960’s was often used to document political events, ephemeral moments, and transient communities. New technology had turned its lens against mainstream media, and made room at the dinner table for alternate voices. What does a queer aesthetic look like in 2010? How can queer community and art come together in relation to specific locations and current issues? These are some of the questions asked by this project. What kind of subversion does simply the presence of a queer community present to mainstream society even today? 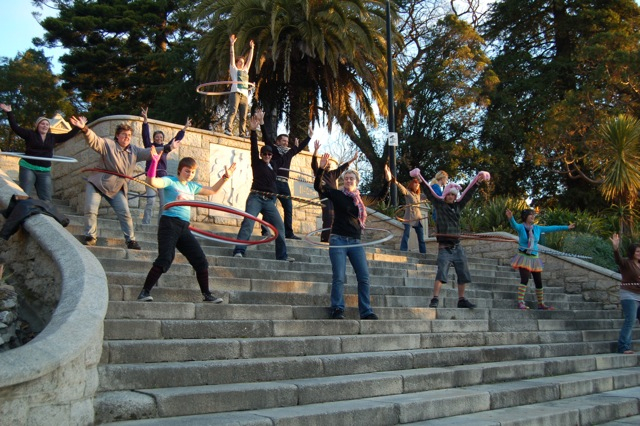 When I told some people who live in Auckland, (New Zealand’s largest city) that I was working on a Lesbian Gay Bisexual Transgender hula-hoop video project, they looked at me with some disbelief and asked, “Is there much of an LGBT community in Nelson?” The question itself was interesting in its assumption about where queer people live. Nelson is a small regional city based around farming, logging and natural beauty. Queer visibility continues to be an issue in regional locations globally. This project became a homage to the Nelson queer community, in particular its youngest members who organize actively in high school and community support groups. As a collaborative project –it involved the participation, creative ideas and good will of a lot of people – so as the artist initiator/organizer I had to “get it right” from the start. 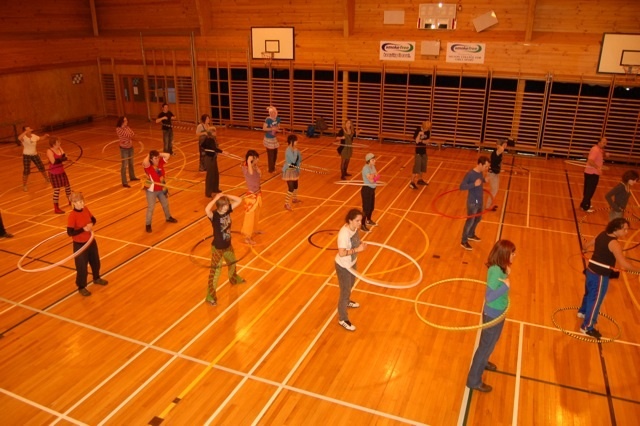 Oh, and I was also asking that participants would learn to hula-hoop and turn up to evening weekly practices over the course of one winter. The project was started by networking, speaking to high school Gay Straight Alliance groups, Nelson’s Q-Youth community group, and spreading the word. We set up a HooP Facebook page, inviting all people who identified as queer in this small town to participate. At weekly meetings in the local College student center, we learned to hula-hoop. Needless to say the younger in age, the easier this was. It was a hopeless first night realizing that adults cannot hoop in child size hoops. YouTube research paved the way for successful hula-hoop construction technology. We built hoops at the Nelson Marlborough Institute of Technology’s (NMIT) Art School workshop using irrigation materials purchased at the local farm supplies store. These were later retrofitted with ball bearings. A filming date was set for July 2010, at the local Girls High School gym, and the video footage left the country a week later when I moved to the United States where my partner took up a position at Boise State University Art Department. The final video project was first screened in November 2010 at Nelson’s regional art museum, TheSuter Te Aratoi o Whakatu, New Zealand. A discussion was held including a Q and A session with a panel of eleven HooP participants from the Suter filming and hosted by curator Anna Marie White. Of the seven participants quoted below, Tabby, Eleanor and Maggie were in high school at the time of discussion. Seb: What was the appeal of the project… to participants…? Tarn: […] for a start I don’t participate in many queer events. The attraction was because it was an art project and because of the kind of quirky people it might attract. I knew Q-Youth were gonna be involved …it was a chance to have a much broader mix of the queer community. Richie: Being an artist I quite like the idea of doing really random stuff that’s not political. Queer stuff is always political in art. It was really good just randomly hooping. It was really cool meeting Q-Youth people. I never knew there were so many of you; I thought there might be one or two. Nick: One of the interesting things for me was, we’d get together in several spaces. We did most of our practicing at the student centre at NMIT for weeks on end. We filmed the event at the gym of the Girls’ College and we all ended up on the Church steps – the Cathedral steps. We stopped traffic, people got out of their cars to take photos…so for me it brought to mind that community can happen simply by virtue of people occupying space and that what can happen there can be different to what normally happens. I guess there was a sense of ownership with some of those spaces you know. Seb: So is it art or is it community action? Seb: Is this a political statement? As Richie said it seems difficult to separate queer culture and political statement. And if it is what kind of political statement is it? Audience member: I love HooP and hooping. Like for me it was hula-hoop and that just sounds so old fashioned. Hooping really modernizes it and its just great. Its like I can Hoop now. … The choice of that prop was absolutely brilliant because there is not one negative thing about hula hooping… its got all these positive connotations – to me it’s just a perfect blend to have the queer community, you’re out and visible with something so positive. Yeah. Kate Walker (MFA University of Arizona, 2005) is a New Zealand artist recently relocated to Idaho where she is currently a Research Scholar and Adjunct Professor at Boise State University. Involving communities of people in art projects as well as exploring an intersection of art and social engagement is an ongoing focus of her practice. She moves between painting, drawing and video work, where narrative devices are used to explore contemporary social issues focusing on colonial histories, issues of gender and sexual identity and cross-cultural perspectives. HooP has been screened at numerous exhibitions, conferences and events. Q-Youth is a Nelson, New Zealand based organization that provides support, information, advocacy and education for queer young people, their friends and families. Previous postRE-POST: FRONT (pdx) Next postHow does the idea of failure relate to your artistic process?